After moving our inherited deck furniture to the new deck we immediately looked less hillbilly. Less redneck, but more "We just moved in and have no furniture." 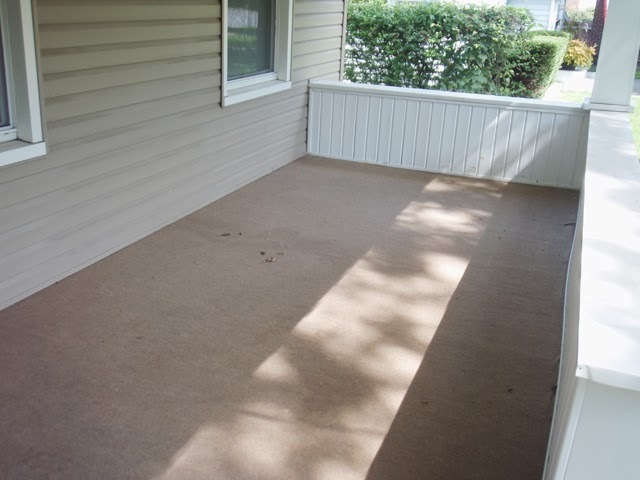 I've always had plans for this area, but never could do anything until we finished the deck and moved the furniture out. Now that we have a blank canvas to work with, I'm ready to go! Since we're like two 80-years-old, we like to sit on the porch and enjoy a drink or two on nice evenings. 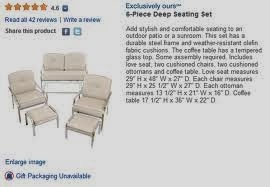 This means that we need some seating - preferably a love seat and two chairs, some type of table and some color so it has some nice curb appeal. I thought that shopping for patio furniture in the middle of fall would give me some deep discounts, but what I found out was - patio furniture is freakin' expensive! Even with the 10-40% end of season sales! 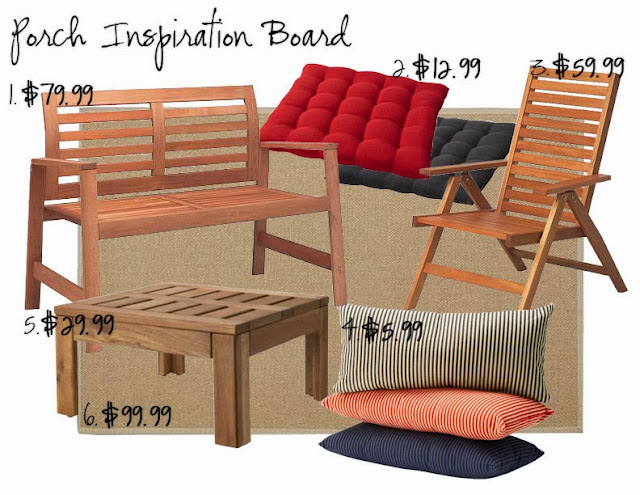 I quickly realized we could be spending close to $600 for some simple seating and pillows! Not exactly what we had in mind. So I looked to my favorite Swedish inexpensive furniture store to see if they had any options. Turns out I really liked the look of Ikea's outdoor furniture and it wasn't to bad on the wallet either. Since I know Mike doesn't like spending money on pretty much anything decorative, I made a special board for him with the prices of all the items so he can see that everything I picked is under $100. While I was in the middle of writing this post I continued looking at other stores and drooled over the expensive options. 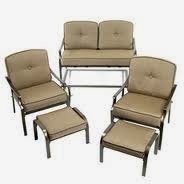 I finally got desperate and did a Google Shopping search of "Patio Furniture Sets". Again, I felt a little overwhelmed by the prices but something jumped out at me this time. This little picture popped up along the right, and I almost jumped out of my seat when I saw the price $299 along the left! With no option to change the color. I was so confused! While I don't mind the white fabric, I hate the silver. No matter which way I searched or clicked links, it always took me to the white set, with no tan set in sight. I guess I was on a patio furniture high because I didn't see this as an issue since I would just stop by our store to check them out myself. I tricked Mike into stopping by the other night under the pretense of "just checking it out". When I asked the woman at the counter she said she didn't have any in stock, but she could order a set, and they were the tan set! I'm not sure what happened since I told you I was in a sort of trance, but I turned around and asked Mike for his credit card right there. He looked at me like I was mad, (but this happens a lot, so I wasn't discouraged) and I started talking really fast about how I can't find one under $600, and all the good ones are red, but that would clash with our red front door, and if we wait too long we won't get to enjoy any of the nice days left. He interrupted my babbling and said he trusted me that I did the research and agreed that we could get the set. We even got the manager to take off the shipping, since the website said they had two in stock, (they said that someone stole two of them and they hadn't updated their inventory) and I argued that instead of putting pants on and coming into the store (under the pretense that they had them in stock) I could have easily did it at home in my underwear. Mike taught me the fine art of arguing speaking with the manager, when you don't feel like something is fair. So, the moral of the story is don't go shopping while your on a patio high, because you will drive home with a order receipt in your hand. And always tell your boyfriend that you "just want to check it out"! I got a shipped notification in my email on Friday, and after checking on it every hour or so it has yet to update UPS' website as to a shipment arrival date so I will have to hold my horses patiently wait to see my new outdoor furniture. Meanwhile I did a Google Image search and found some better photos of the set. Since I've yet to see this puppy in person, I'll let you know what I think when it arrives. We're hoping it comes in time for Halloween since our neighborhood does it up big and if the weather is nice we all sit on our porches. We'll be classing it up this year. A major improvement over the folding chairs last year. What do you guys think? Do you think I'm crazy for buying furniture without seeing it in person? Has anyone else gone to the store in an "online-find high" and ended up buying a big purchase? I'd love to hear that I'm not the only one!